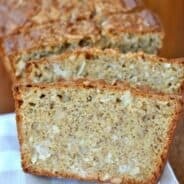 Beer bread is one of those items I used to purchase from Tastefully Simple and Pampered Chef. We ate it often too! Then I googled the recipe years ago, and realized how easy it is to make at home (FOR MUCH CHEAPER)! Not a fan of beer? Don’t keep it in the house? That’s okay. I have made it with 7up as well, it just ends up a little bit denser (I think it might have something to do with lack of yeast????). In large mixing bowl mix flour, baking powder, salt, sugar, cheese and green onions. Using as few strokes as possible, mix in the beer until moistened. 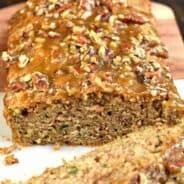 Pour thick batter into a greased loaf pan. Drizzle melted butter over the top. Bake in a 375 degree oven for 50 minutes. Remove and cool 10 minutes before removing from pan. Enjoy! No way!!! I always buy this from Tastefully Simple too…I never thought to google it for a homemade version:-) Yours looks so yummy and crusty!!! My husband would love this!!!! 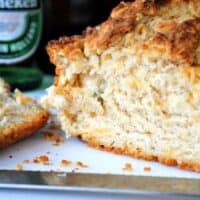 We’ve fallen in love with beer bread, so simple and fast! ha! My friend ordered this from Tastefully Simple a few months ago, but this is awesome that you can make it homemade!! Love it 🙂 thanks Aimee!! Mmm, I love beer bread. Just can’t bring myself to buy beer for it (too expensive!). Your cheese and onion version is awfully tempting though. This would be perfect along side a good thick chili! I bake Challahs (Jewish bread) each week, but never tried beer-bread. I love any kind of cheese bread. This sounds wonderful. I go to a pot luck and they never have any butter. I brought butter once for bread but it disappeared. This is a perfect bread for that pot luck because it looks very moist-so no butter needed. 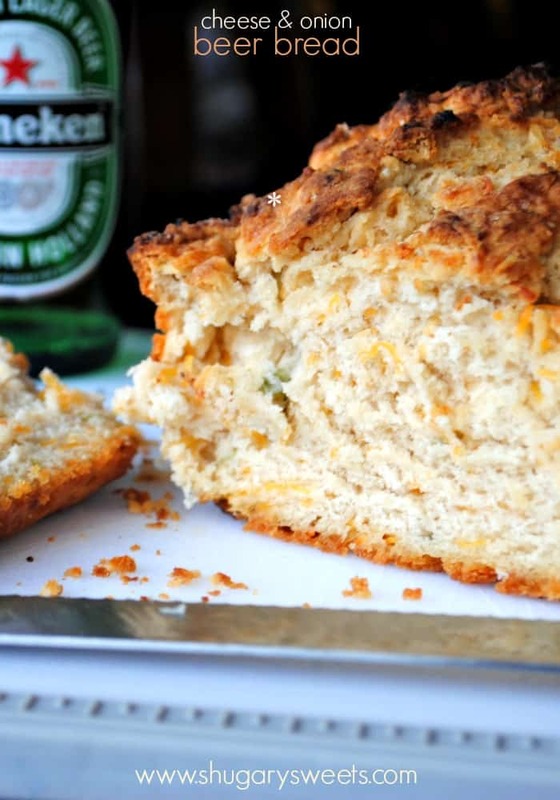 Beer bread does sound so much more tastier with cheese and onions in it-yum. Have a great afternoon. WOW, that sounds delicious! I’m German and love my beer breads, and cheese on onion sound like utter bliss 🙂 Looks wonderful! Wow, SO easy! This is awesome! I love the cheese and onion in here too…but like you said, the possibilities would be endless here. Yummers! I am a faithful TS beer bread lover! I have to say though, I have never made a variation with cheese or anything else. 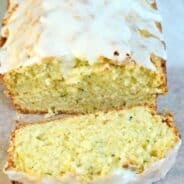 Did you know you can add mountain dew and cinnamon chips to make a sweet bread with it? Have you ever tried that with the homemade version? YUM! This looks like something I could just sit and eat half of in one sitting! Looks so good…can’t wait to try this recipe..pinning it! Sounds delish! I printed out the recipe for the bread and I am going to try to cook it on my Big Green Egg. bread. check. cheese. check. beer. check. DONE DONE AND DONE! making thisss! Making this!!! Do you think Corona will wokr? Thats all I have at home. He he so excited! This looks wonderful!!! We love love beer bread. We have a great recipe on our site for it too. Your additions look fantastic. I am trying your version tonight. What a fun and delicious bread! yum! looks delicious! Thanks for linking up to the Tuesday Talent Show! I hope to see you again next week! This looks delicious and simple to make. Two important factors in my book! 🙂 I pinned this on my recipes to try board. Does it matter what kind of beer you use? I have stone IPA at the house right now.. Not sure if that has too strong of a taste. What do you think? As for the kind of beer to use, I usually use an amber or light variety. I haven’t used anything dark, but you could certainly try. Made it last night and it tasted great! I used 1 cup rye flour and 2 cups all purpose flour. Thanks for the great recipe! I am having a beer & chili tasting party in a couple of weeks! This is perfect! Thanks for the recipe! Yummy! And really simple to make, a fun idea which I’m going to try and make next weekend for a little get together. I tried this today without the onions and it was delicious! I was a faithful TS Beer Bread buyer but this was so simple, cheap and easy. I will never have to wait again. Thank you very much. Don’t tell the Tastefully Simple consultants!! Actually one of my good friends is a TS seller and she knows already! Glad you enjoyed the bread. Normally I do not learn article on blogs, however I would like to say that this write-up very forced me to try and do so! How much is 12oz beer in liquid measure. I’m not American. Can you put this in millilitres or fluid ounces? Your measurements are different to mine. Thanks. 12oz beer is 12 fluid ounces. 12 US ounces equals 340 grams. thanks for sharing the recipe, can i use 7up instead of beer ….. This recipe is really good. I subbed pepper jack cheese to spice things up a bit. I followed the directions, cooking time and everything came out perfect. Thanks for the recipe. You’re welcome! Love the addition of pepper jack cheese. My house smells heavenly, as we wait to take this bread out of the oven! I paired it with a beef barley soup! OMG!!!!!!! I just took my first bite and am in heaven!!! So easy to make and it tastes amazing!!!! Thank you for the recipes!!!!!! This is so awesome. I now make three loaves at a time.